The face, due to its daily sun exposure, is a common area to have skin cancers arise. The treatment of these cancers (e.g., basal cell and squamous cell carcinoma and melanoma) often requires having a specialized dermatologist perform Mohs surgery to carefully remove the cancer, while sparing as much normal surrounding skin as possible. This is particularly important in cosmetically sensitive areas of the face such as the nose, eyelids, lips and ears. If the skin defect that results from the Mohs surgery is challenging to close, patients are commonly referred to a facial plastic surgeon that specializes in repair of facial defects. Dr. Bryan Ambro has extensive reconstructive experience and has worked in tandem with many of Annapolis’ dermatologists to assist in closure of simple and complex skin cancer deficits. This team approach ensures that the patient receives the best quality care, in a convenient and comfortable fashion. 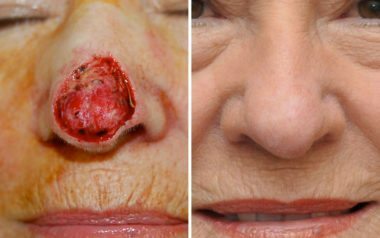 Skin cancer reconstruction surgery. This patient underwent a paramedian forehead flap for reconstruction of her total nasal tip skin cancer defect.